The BITS Behavioral Incident Tracking System provides you with a tab specifically designed to help you keep track of behavioral incidents. This screen can literally replace a desk covered with paper reports. 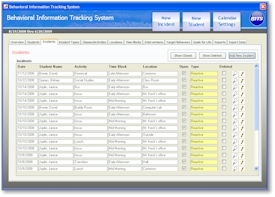 This screen acts as an incident log for all of your students and can be filtered to show only unresolved "Open" incidents or all incidents. This is the date of the incident sorted in decending order so that the latest incident is always at the top of the list. Simply the name of the student - last name first. 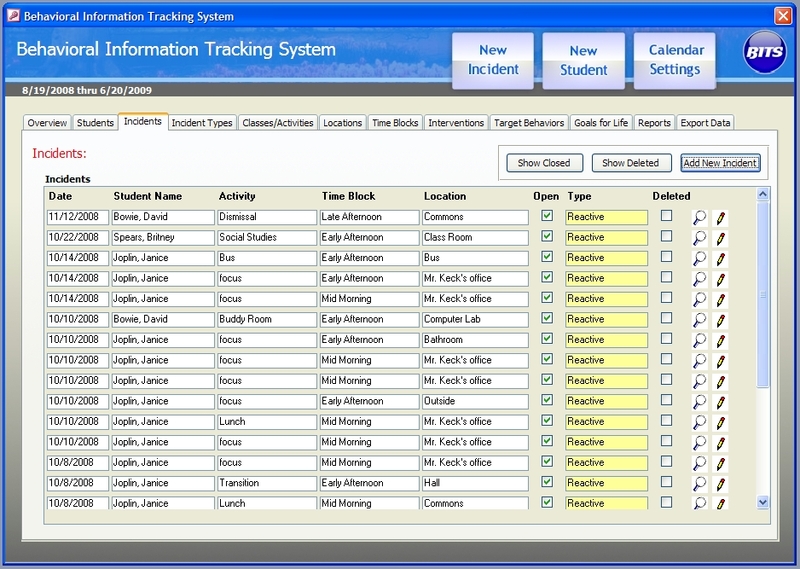 You can create new students and manage them using the Students Tab. The Class or Activity in which the student was participating when the incident took place. Classes/Activities are all fully customizable and managed in the Classes/Activities Tab. The Time of Day in which the activity occurred. Time blocks are also fully customizable and are managed in the Time Blocks Tab. This is the physical location that the student was in when the behavioral incident occurred. As with other fields in this log, Locations are defined by you and are managed in the Locations Tab. This check box indiciates that a behavioral incident is "Open" and has not been resolved with some form of "Intervention". Like most things with the BITS behavioral management system, all Interventions are defined by the user and can be managed in the Interventions Tab. This is the general type of incident that has occurred. Incident types are broken down into either Preventative Incident Types and Disciplinary Incident Types. You can create as many incident types as you would like in the Incident Types Tab. The Incidents log also has a button available which prints the Student Incident Report. The Student Incident Report details the incident being tracked. This can be very useful as a form of documentation and communication with parents, counselors or other administrative staff.